Making adjustments for your cat’s mental comfort is as important as providing for its physical well-being. 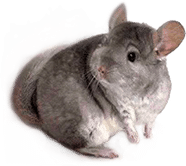 A kind owner should ensure that all the pet’s needs are being taken care of, no matter if we’re talking about food, emotional status, or about the quality of its entertainment options. Investing time and effort into the things above will make sure your bond will strengthen in no time, and that you develop that special relationship where you make each other’s day just by being around one another. And another great thing is that it doesn’t cost a lot of money to do so. Just a little bit of patience. To make sure you play safely with your furry friend, you need to pay attention to some vital things. For example, cats love playing with strings. No matter if we’re talking about yarn, guitar strings or your precious cables, cats can’t have enough of them. However, they can be quite dangerous, and could even strangle themselves with those cables if you are not around to supervise them. So if you are planning a safe entertainment session, make sure the strings you play with are made from soft materials that you can cut or rip with ease if necessary. You can buy specially designed cat toys, including string shaped objects, which respect all the safety standards so you won’t have to worry that your little one will get tangled up without the option of freeing itself quickly. Speaking of yarn, you need to be careful that your cat doesn’t lick the material, as those little spikes on its tongue don’t shift and they only face one direction. This means the cat will force the sticky yarn to go inside its tiny mouth, which can pose choking hazards. This is the reason, we think, why you should invest in toys created by designers and not homemade. 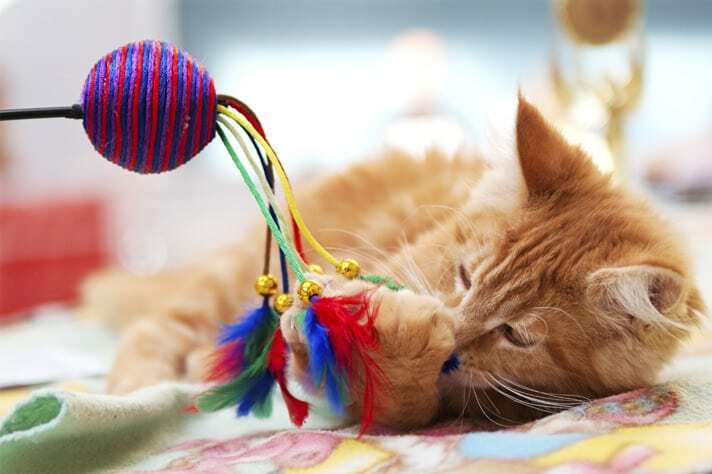 The market is abundant with self-play toys that your cat can play with on its own. Toys that simulate chasing and hiding are typically favorites among cats. Some inexpensive options for you, if you don’t want to buy something premium, are cardboard boxes and balls of paper. You can also go for interactive toys. These products help strengthen the bond between you and your feline companion by allowing you to be a part of the positive experiences, which can be quite entertaining if you have a clumsy cat. 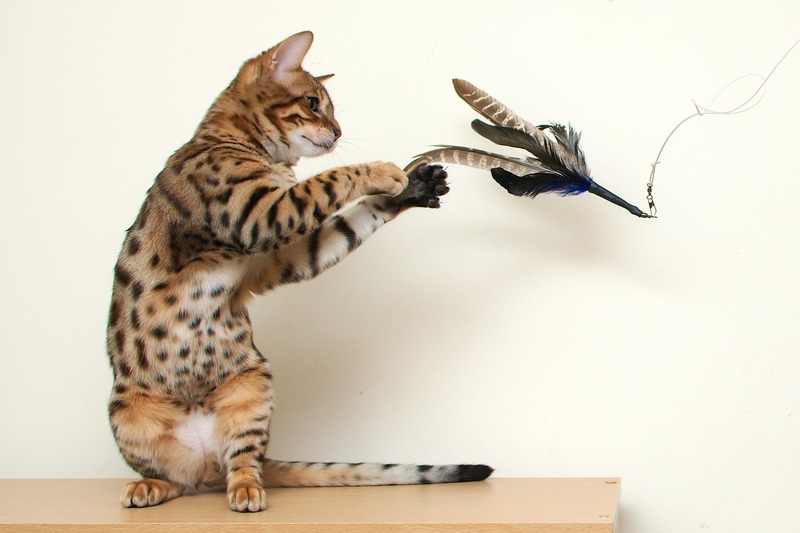 You should definitely look up wand-like toys with strings and feathers attached at the end. It doesn’t get cheaper than this. A foraging toy, or a food puzzle, is also an excellent tool to use if your furball eats too quickly and if you want to experience fun safely. All you have to do is fill the food toy with treats, and your cat will learn how to use the exciting mechanism of the toy to release these tasty rewards. This will keep it entertained and safe from swallowing food too fast.